The Heartlands development at Spellowgate is celebrating early sales success, with a number of new homes having already been sold from plan. The development itself boasts a range of three and four-bedroom homes, many of which are ready to move into now. Heartlands is made up of 84 stylish properties, suitable for everyone from first time buyers and downsizers to young professionals, and families and those looking to step up the housing ladder. Designs currently available to reserve include the Marston; a three-bedroom semi detached home with kitchen/dining room and separate lounge – a perfect property for those stepping onto the housing ladder. The four-bedroom Barlow and Berkeley detached styles are also available to reserve. These family homes boast spacious ground floor with open plan kitchen / dining / family room and separate lounge. Linden Homes has a number of incentives available for buyers to help curb the cost of moving. For those who have an existing property to sell, there is Part Exchange. Linden Homes will arrange for at least three independent valuations of your existing home and will make you an offer based on their suggestions. Once you agree the offer, and subject to satisfactory surveys, Linden Homes becomes your buyer, freeing you up to put in reservation on your new home. After that, it's a case of setting a moving-in date, boxing up your things, and basking in the relief of a quick chain-free move to the home of your dreams. You can stay in your existing home until your new one is ready. There is also the chance to curb the cost of moving further through the Help to Buy scheme, where eligible purchasers need only a five per cent deposit. Available to first time buyers and existing property owners, with a 20 per cent equity loan from the government, they can buy the home with just a 75 per cent mortgage and 100 per cent of the home is theirs! 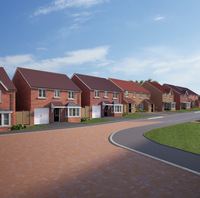 Prices at Heartlands currently start from £179,950. The sales and marketing suite is open daily from 10.30am until 5pm. Alternatively, visit lindenhomes.co.uk. Driffield itself is home to an abundance of sporting clubs and leisure activities, and fabulous local places of interest including Burton Agnes Hall and Sledmere House. The local area offers a number of other day-to-day amenities, an abundance of exceptional places to eat and drink, many high street stores and independent shops within the bustling town centre and a range of health services. Often referred to as the heartbeat of the Wolds, Driffield is perfectly located close enough to major destinations like the bustling Cathedral City of York, 2017 City of Culture, Hull and the stunning North Yorkshire Moors, while being an ideal place to take a break from city life. And you are never too far away from the hustle and bustle of a thriving city centre or the slower pace of a seaside town – with Beverley around half an hour away, and Scarborough a little further.